Six months ago I made some general comments about the musical vocabulary of Tim Smith (of Cardiacs). Here are some notes on “Odd Even”, a song that illustrates a lot of his standard tricks. 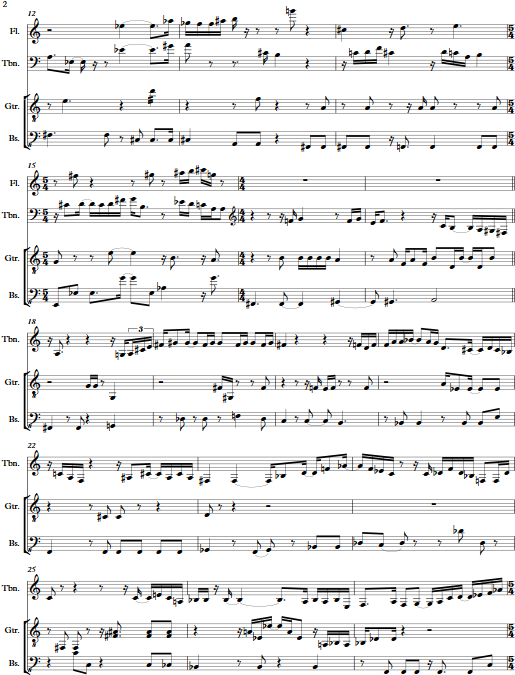 The song is on YouTube here and my transcription is here (PDF file). The form could not be simpler: three repetitions of verse (a 7-bar phrase repeated twice) and chorus (8 or 12 bars; in the second and third choruses the last 4 bars are repeated). The third verse is instrumental. The introduction (which foreshadows the end of the verse phrase) is a straight-out “Smith cadence” (♭III–v–I in the key of E), which already renders it unclear whether we’re in the key of G major (starting on the tonic and repeatedly raising the tension) or E major (starting on the flat mediant and repeatedly resolving the tension). This ambiguity will persist throughout the song. The start of the verse seems to resolve the question by claiming that we’re in G major, and could not refer more explicitly to the Lydian mode, with a C♯ over the G chord. Already this is a hint that we might be moving back to the sharp side soon. There’s an interesting clash between that C♯ of the melody and the C♮ of the C chord that arrives on the second bar. The harmony then moves through A and E back to G, apparently establishing that E is subordinate to G—but then immediately repeats the introductory Smith cadence twice, reestablishing the ambiguity. The phrase rhythm of the first verse phrase is also quite interesting. From the melody alone it looks like a pretty straightforward [4+4]+4 beats, but the harmonic rhythm, as well as the way that the instruments enter during its first statement, implies 6+6. The chorus starts by moving fairly strongly to the flat side of G, going all the way to E♭ before slowly relaxing back to G, and right through G all the way to Bm and E again. The feeling of resolution provided by G is lessened this time by it happening for only two beats on the second half of a bar, rather than lasting a whole measure as it did before. The melody here is really nice; a drone-like D is continually returned to on the bottom (it’s a common tone of all the scales passed through, including the E Mixolydian implied by the final destination of E) while the upper implied voice of the line descends from B♭to A to G, then returns up to B♮ and G♯ to both chromatically fill that third and also strongly establish the “surprising” E (not so surprising in reality since the G–Bm–E sequence has been repeating the whole song). The chorus ends by following yet another path from G to E, this time by repeating the triple plagal cadence G–D–A–E and sitting on the final E for an additional bar. That relaxation of the harmonic tension certainly makes it seem like E was the final destination after all—but when the next verse starts up again, back in G, it feels like a return to the tonic rather than a jump away from it. The instrumental verse suddenly triples the melodic speed, and it’s interesting to see such a relatively hyper solo in the middle of what is otherwise a fairly sedate song. 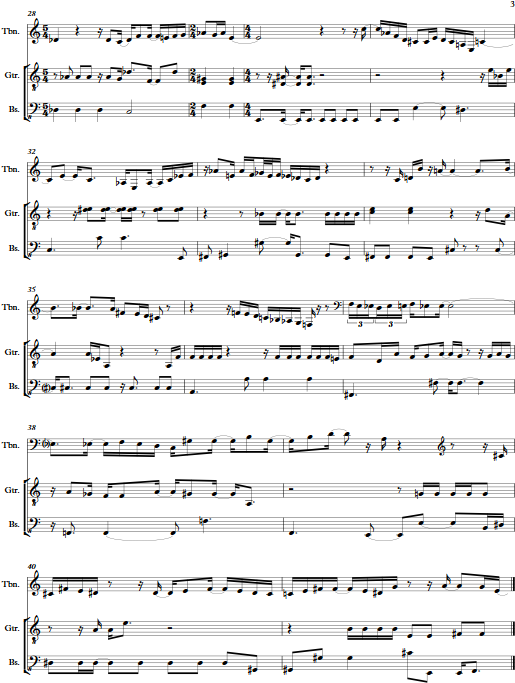 I wouldn’t have thought of it when I first heard the song, but after listening to a lot of jazz in the last month, the solo has sort of a bebop feel to it, at least when you look at it on the page and imagine it being played by a saxophone rather than by a keyboard. It looks complicated but it is largely doing the same things found elsewhere in this song or Smith’s work in general—emphasis on that Lydian C♯, liberal use of whole-tone scales, and near the end a gleeful insistence on B♭, a note dissonant against both G major and E major. The song ends with a final chorus, repeating that G–D–A–E progression four times in a long exhalation and landing with relative finality on E. So maybe it was in E major all along? But I think the fight between the two potential tonics the whole time was a charade; the whole point is that both G and E are equally important, and to proclaim one of them superior to the other is to force one point of view on a song that is all about presenting two. I’ve always liked the sound of jazz but have never been as interested in it as rock or classical. Recently my interest has flared up a bit, and I’ve been trying to make up for lost time by listening to more of it with active ears. The standard approved way to work on your analytical technique seems to be to make transcriptions of classical recorded solos, so I picked up the first random jazz CD that was at hand, Bud Powell’s The Scene Changes, and sat down to transcribe the first number, Cleopatra’s Dream. Unfortunately 1) it’s a very fast tune (quarter note = 240), 2) it’s in A flat minor (that’s seven flats), and 3) Bud Powell, like I suppose any good pianist, uses both hands. So maybe it was not the best song to transcribe first. Nonetheless I ended up with something that is at least moderately accurate, especially in the right hand, and it can be found here (PDF file). I did learn a bit from this exercise about how Powell improvises, and it was good practice for my ears, so it was certainly a success on those fronts. 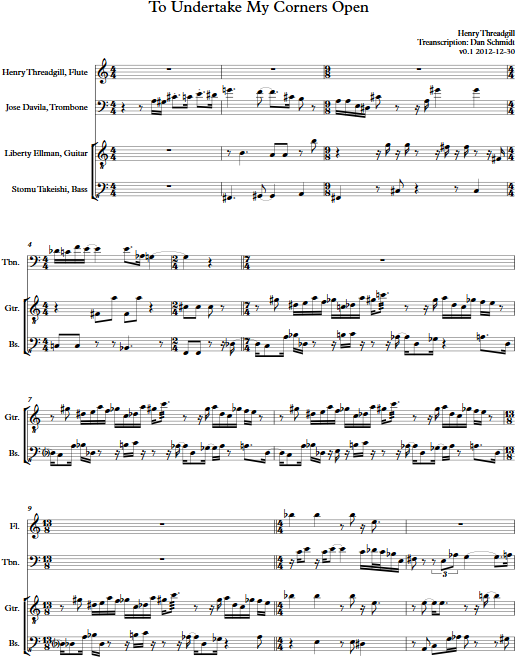 If anyone has suggestions or corrections, especially actual jazz musicians who can tell me, for example, “this line you sketched out in the left hand is not what anyone would ever actually play, he must be doing this instead”, I’d love to hear them.